Discuss the individual child’s health requirements and routines with the family. Document this on the enrolment form. Describe some questions or concerns about a child’s health needs that you may need to convey to their family. How do you maintain confidentiality regarding children’s individual health needs? Identify where your service would access information on current hygiene practices. Explain how you would maintain written procedures and schedules to ensure a regular regime of washing children’s toys and equipment. List some important hygiene information that services may provide families. Discuss different ways in which a service can give families this information. Explain how you ensure that your service has current records of a child’s immunization status and that they are up-to-date? What procedure is in place to maintain the currency? Explain how you would advise families and public health promotion authorities where necessary of cases of infectious diseases at the service and provide them with the relevant information. Explain how configuring groupings of children can minimize risk of illness and injuries. Access your Service Allergy Policy and procedure. Describe the risk management strategies in place for children with severe allergies. What is anaphylaxis? What are the most common triggers of anaphylaxis? What is a Pippen? How does it help an anaphylactic reaction? Provide an example of an action plan for anaphylaxis. Read the scenario, and then answer the question that follows. 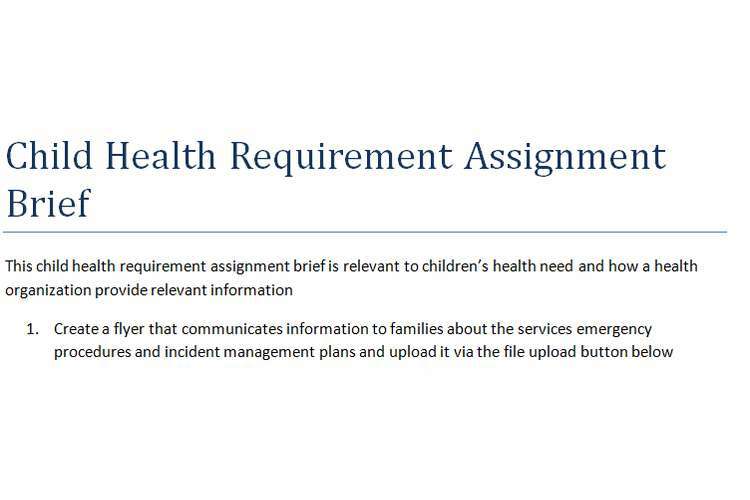 Explain the next steps you would take after checking the health information fact sheet. What are the symptoms of asthma? Name possible triggers? Access your Service policy regarding asthma and describe your role in administration of asthma medication. Access your Services health safety and hygiene policies. List four policies and describe your role in ensuring these policies and practices are implemented. Describe strategies and activities you could use to provide information to children about health and hygiene. Zahli’s mum has informed you that Zahli has a Milk Allergy. She has requested that Zahli is provided with A2 milk rather than normal milk. Conduct research use the following site http://kidshealth.schn.health.nsw.gov.au/fact-sheets to identify if using A2 milk is suitable for a Milk Allergy. Explain your findings in the space below.